The internet provides a potential audience that extends to anyone in the world. Around a year ago I wrote about an innovative concept for constructing new futsal courts and supermarkets were identified as one of the suitable locations to build them. 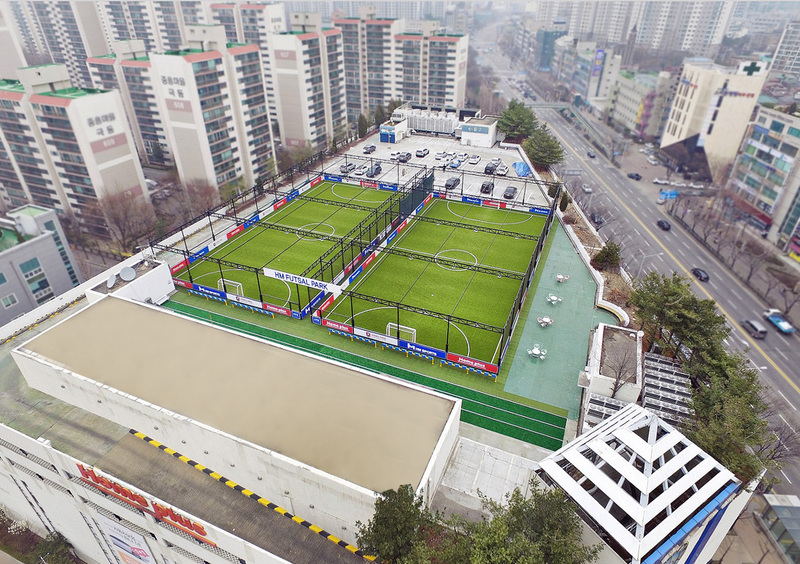 Well, it seems that somewhere in South Korea a supermarket executive came across the article as a company there has begun installing futsal courts at their stores. A few decades ago retailers started locating their stores on cheaper out-of-town land. This included grocers who created lucrative hypermarkets with a wide range of products that captured a significant proportion of consumer spending. To increase their future profits, the grocers began purchasing land as fast they could for prospective stores and to keep it out of competitors’ hands. In the UK alone, the top four supermarkets had just under 45 million square meters of space for new development as of 2015. However, in recent years there has been an unforeseen change in shopping habits. Increasing importance given to convenience, quality and value has meant people have shunned the big out of town stores, malls and retail parks for local small shops, online shopping and discount retailers. With the profitability of hypermarkets heading in a downward direction, of that space the top 4 supermarkets owned, a mere 15% was under construction at the time. The usual approach of the big grocers to competition was to lower prices but they were no longer able to undercut the new entrants represented by the no-frills discounters such as Aldi, Lidl and Poundland. Therefore, they’ve been frantically searching for an effective strategy to sustain the profitability of their existing hypermarkets. They have tried filling the underutilised space with restaurants and subletting to other retailers but it hasn’t provided a compelling enough reason to attract customers and the success has been limited. This is where futsal presents a potential solution. Families are the big spenders that grocery stores need to attract and they are also short on time. 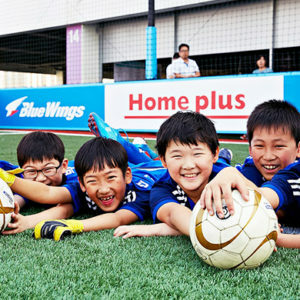 By placing futsal courts in car parks, empty stores and roofs of hypermarkets, malls and retail parks, a family could do their shopping while the children are occupied playing futsal. Combining these two activities would be very attractive proposition for families who would treat a visit to the store as a day out and gives a much more enjoyable and convenient shopping experience. For the retailers, it gets these big spending families to their stores and with time to browse, resulting in more of their household spend going into their tills. 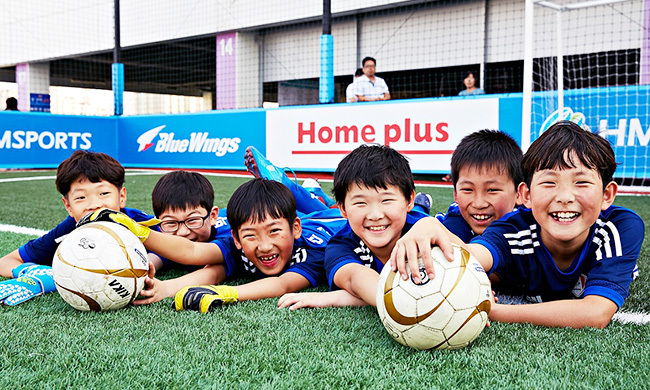 This is what the South Korean company Homeplus (owned by British grocer Tesco until 2015) is achieving by executing a plan to put 10 futsal courts at various stores. This is part of a strategy to make visiting their stores more attractive and transforming them into a cultural complex rather than just about retailing. 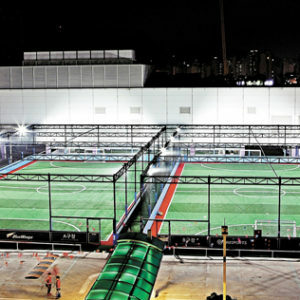 They have already put full sized futsal courts (42m x22m) on a car park roof at one store, partnering with local clubs to provide sessions for children and with plans to host youth tournaments. It is proving an incredibly successful strategy. In 10 months since opening it has attracted 14,000 children and had a reservation rate of 90% on week nights and almost 100% on weekends. This is all having the intended effect of translating into more shoppers and sales for their revived stores. Visitors rose 15% after opening and the company estimates it will lead to an extra 50,000 customers annually. 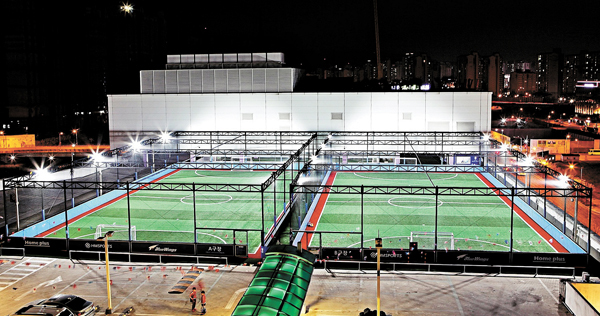 Building futsal courts at these types of locations should become more widespread as it is beneficial for both parties. Retailers get an attractive proposition for customers to visit their stores and futsal clubs and local communities get desperately needed facilities. From the UK to South Korea and many places in between this collaboration will work as many countries have experienced the same trends. I hope that other retail executives around the world are reading this and increase the number of futsal courts as a solution to the challenges their businesses face.